Save money. Save time. Save hassle. Only pay when you save! What do you want us to help you buy? Think you can beat a seasoned salesperson at their own game? Think again! 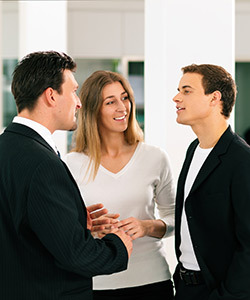 You can think of us as the salesperson on your team. When you are making a major purchase you need some serious firepower. Hire an expert Buyologist to help you get the job done and pay no more than you need to! We are in the business of saving you money. With a Buyologist on your side, you will get what you want at the absolute lowest price. If we don't save you any money, you don’t pay us a cent. Easy! And we offer an unconditional 100% Satisfaction Guarantee. Avoid hassle and stress. No wasted time. No regrets. You have better things to do with your time so why not let us look after it for you. We are good at it and what’s more we love doing it. We combine buying expertise with honesty and integrity. At Buyologists you are guaranteed full confidentiality and completely unbiased advice. We are independent and completely on your side. Please believe us, no matter what the salesperson tries to tell you, they are not! Why pay more than you have to! Take advantage of our years of experience and expertise to help you save money on your major purchase. It’s easy.... You only pay us if we save you money. Why waste your time trying to find what you are looking for when you can have an expert do it for you. We know where to look and who to talk to, to help achieve the best possible outcome for you, while you concentrate on doing what you enjoy and know best. It’s hard to know where to start when you are looking to make a major purchase. Everywhere you look you will get pulled in different directions, leaving you confused and overwhelmed. Negotiating on major purchases is what we do best and probably unlike you we absolutely love it! 1 We talk with you, listen carefully to what you need and the best price you have found so far, and then agree on a success fee for your purchase if we can do better for you. 2 We research and evaluate the marketplace for the best available options. 3 We discuss our findings with you and agree the best way forward. 4 We help you make the purchase at the best possible price. 5 You pay us only if we save you money, easy! We asked Mike to help when we were looking at buying a new home/hobby farm in the hills. We had decided on what we thought was a fair price we were happy to pay, but much to our surprise Mike ended up saving us a full $100,000 below that price! Suffice to say we were very happy indeed with his help and would highly recommend their services to anyone else considering buying a new home! The lesson we learned was that price is always very much negotiable, and that often it’s impossible to tell how much the vendor is really expecting or willing to accept. Engaging an expert was truly a great decision for us! Having chosen to invest in a new, luxury car, we naturally wanted to secure the best possible deal. Engaging the services of Mike Chalmers, Chief Buyologist, gave us great comfort given Mike’s sales and purchasing experience, his winning demeanour and his high level negotiation and communication skills. Throughout the process Mike kept us informed, updated and involved. Above all, he made it look like fun and ultimately achieved an exceptional outcome. Mike engaged our Accounting/Advisory firm to help sell his previous global merchandising business, when he decided he wanted a change after almost 20 very successful years. The stand-out strength in their business model, that just leapt off the page, was the amazing margins they were able to achieve, in what is an extremely competitive industry. Mike was ultimately able to offer extremely competitive pricing to his clients, simply on the back of their extraordinary supply chain management and procurement expertise. So much so, when we sent through the Business For Sale Memorandum to a few interested competitors, several questioned whether the margin figures were accurate, which they absolutely were! Suffice to say I have absolutely no hesitation in referring the services of Buyologists to you, as an expert in the field who will help you to save money, time and stress. We are also referring our own clients to him, to help them realise savings in their overheads and expenses, while they focus their attention on the important task of trying to grow their business. Click the image below to read an introductory article on negotiation skills. Written by Mike Chalmers, Chief Buyologist. 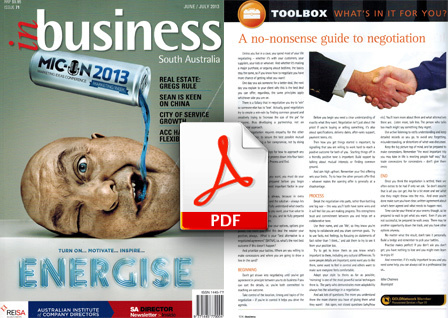 Published in InBusiness Magazine, June 2013 Edition. Watch the following video for Monty Python's humorous but accurate take on the topic of negotiating with a salesperson. In the meantime we invite you to browse our Frequently Asked Questions page, which answers lots of the common questions our clients ask us. What would you like us to help you buy?